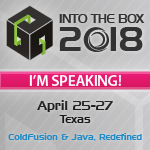 I've been meaning to post the slides the presentation I gave at cf.Objective() 2009 on Hardening ColdFusion for a while, but I don't think there could be a more important time than now! This presentation doesn't focus on the CFML coding side of security, but is rather on the administration, and server side of things. I attended your original presentation and wanted to say thanks! The information is very useful ... as a developer, this is one area that I tend to overlook, when I know I really shouldn't. Thanks again! You're Welcome Steve, I'm glad you found it useful! Great article Pete, should be a must-read for every webmaster and cf-coder. Thanks for sharing it.